A realist painter, I enjoy riffing off the old masters--so-called "art about art", as well as painting landscapes, portraits, self-portraits and even the occasional still life. Whatever the subject, I seek an arresting image, expressed with clarity and, where possible, augmented with hints of mystery or wit. "The Painter", here, comes closest to summing it up. 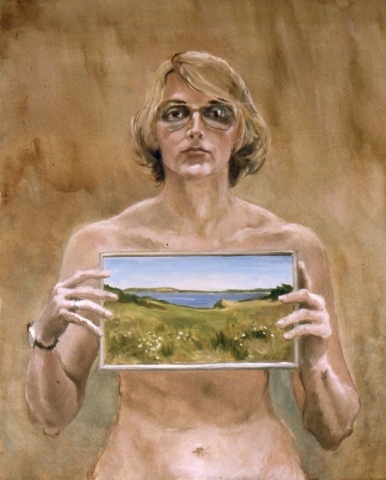 After many years of exhibiting figure paintings in New York City, I was dismayed at being known only as a landscape painter on Long Island, where I have lived most of my life. This self-portrait was an attempt to set the record straight. The landscape within the figure painting is now in the collection of Dr. and Mrs. James D. Watson. The aviator glasses have been replaced by a rimless pair, but the watch still tells me it is later than I think. I have designed this website as a kind of slide talk, going beyond title, size and medium to the thought processes that make up a work as much as brushstroke, canvas and paint.